While we in the Philippines don't normally celebrate Thanksgiving, Novemeber or even as early as September, marks the beginning of the holiday season for us jolly Pinoys. And in celebration of these months of festive merriment, Marriott Manila hosts a variety of means to take your appetite for food, family, fun and fulfillment to the next level. But even if Thanksgiving is not widely celebrated in the country, we have no reason not to join the fun. So this November 28, for P2,100, Marriott Café will offer a smorgasbord of classic and homey dishes that will surely bring you the wistful tastes of Thanksgiving. How would you like to start your Thanksgiving meal with a lentil salad with spinach and pecans? Don’t miss the seafood on ice section too where blue crabs, whole tiger prawns, Chilean mussels, and curacha crabs are aplenty! For something hot and comfy, a bowl of sweet potato and squash soup, or Manhattan crab chowder sounds divine. And of course, Thanksgiving will not be complete without the main event -- the honey cinnamon-glazed roast turkey basking in all its juicy glory. 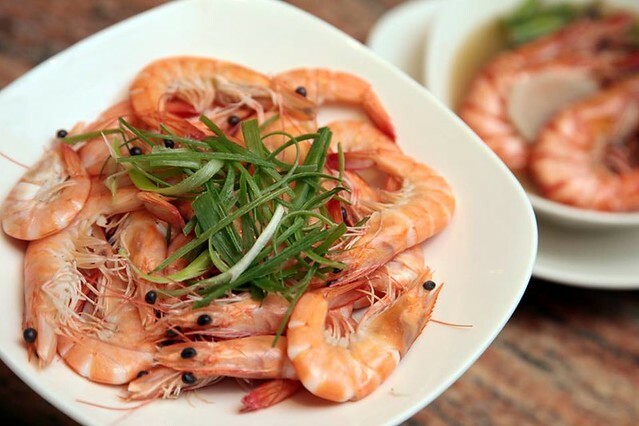 There are more gustatory treats for more of your carnivorous cravings as well. How does roasted US choice prime rib-eye, pork knuckle, barbecued charsiew, soy chicken, and roast duck sound? And if the Asian and pasta sections don't fill you up to the brim, cap the night off with some pumpkin pie in caramel sauce, pumpkin cheesecake with cherry compote, and more home-style baked goodies and saccharine treats. For an intimate kind of revelry, a 4-course dinner at Cru Steakhouse may be more fitting. On November 28, bask in the chic, cozy atmosphere of Cru and indulge in both the delicate and robust flavors the renowned restaurant has to offer at P2,100. If you wish to celebrate Thanksgiving in the comforts of your own home, whether it’s a feast for your family and friends, or a special dinner with your colleagues, it's best to have an early order of Marriott's original roasted turkey. 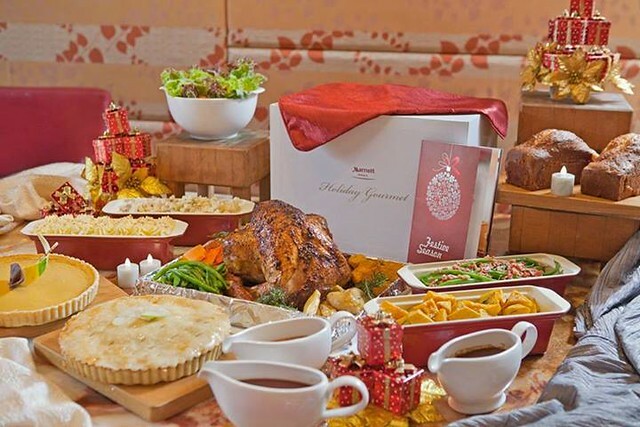 At P7,500, you can enjoy a spread that includes 6 to 7 kilos of whole roasted turkey, cranberry sauce, lettuce salad with dressing, potato salad, a kilo of classic stuffing, pan gravy, buttered mashed potato, brussel sprouts with bacon, baked pumpkin, baked pumpkin pie, and baked apple pie that can last you all the way till Christmas or even until the New Year! Available from Nov. 28 to Dec. 25, this package is sure to complete your celebrations, so no need to stress over all the preparations! Just call Marriott Manila at least 24 hours in advance, and an impressive spread will already be awaiting to satisfy your appetite. Nothing ends a filling Thanksgiving meal better than a slice of piping hot pie. And at Java+, decadent holiday pies are available for sale starting at P800. 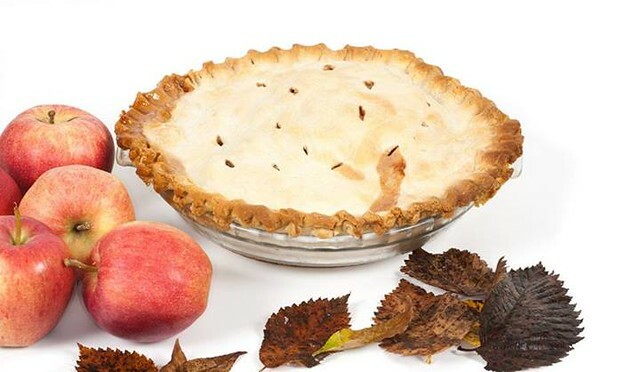 These 8-inched homemade delicious pies come in four flavors: buko, mango, pumpkin, and apple, perfect for sharing as a dessert or just a pick-upper for the sweet tooth in you. Thanksgiving is truly a season of milestones, realizations, and gratitude, and what better way to share the warmth of the season than with good food that is distinctly Marriott. For more information and updates on Marriott, visit www.marriott.com/mnlap or www.facebook.com/marriotthotelmanila.